Strongly-fancied for the Weatherbys Super Sprint at Newbury over five furlongs last time out, Red Balloons raced off the lowest weight on this occasion. As the action moved from the centre of the track to the stands rail, the favourite Masaru found trouble in running while in contrast Barry McHugh and Red Balloons enjoyed a trouble-free passage. Relishing the extra furlong, the winner picked up in fine style to beat Alfie Solomons by three lengths. “We really fancied her in the Weatherbys Super Sprint, but she was very disappointing,” said Fahey. “Whether the step up in trip helped her, I don’t know, but everything went right. 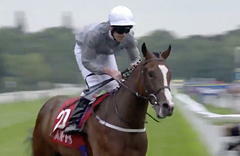 “There’s the race at Redcar (Two-Year-Old Trophy) and I think she’s in the sales race at Donny.